Neten Chokling Rinpoche (Tib. གནས་བརྟན་མཆོག་གླིང་རིན་པོ་ཆེ་, Wyl. gnas brtan mchog gling rin po che), aka Rigdzin Gyurme Dorje (b. 10 August 1973) — the Fourth Neten Chokling was recognized by both H.H. the 16th Karmapa and Dilgo Khyentse Rinpoche as the reincarnation of Neten Chokling Pema Gyurme. He was born on the tenth day of the eighth month to a poor family in Wandipodzong, central Bhutan. H.H. Karmapa named him Gyurme Dorje. At the age of seven, he was taken to his monastery—the Pema Ewam Chögar Gyurme Ling Monastery—in Bir, India, and en­throned by Dilgo Khyentse Rinpoche in Clement Town at the monastery Ngedön Gatsal Ling. Before arriving in his home monastery he was also enthroned in Rumtek by H.H. Karmapa. He has received the transmissions of the Kangyur, Nyingma Gyübum, Nyingma Kama, Rinchen Terdzö, and Chokling Tersar as well as many other teachings from Dilgo Khyentse Rinpoche. 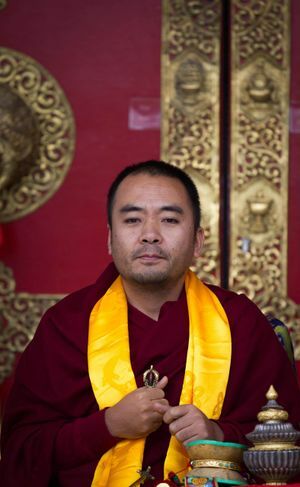 Orgyen Tobgyal Rinpoche, one of the sons of the previous Neten Chokling Rinpoche, participated in the education of his father's reincarnation before transferring to him the full responsibility of his monastery in 2004. Neten Chokling Rinpoche is married to Tenzing Choyang Gyari, the second oldest daughter of Lodi Gyari Rinpoche and their son is Tulku Urgyen Yangsi Rinpoche. He acted in Dzongsar Khyentse Rinpoche's films The Cup (1999) and Travellers and Magicians (2003). In 2006, he directed his own first film, The Life of Milarepa - Part I (See Exteranal Links below). Neten Chokling Rinpoche has been coming regularly to Lerab Ling since 1996 with monks from his monastery to hold drupchö and drupchen practices, for which he sometimes gives empowerments.